Do you know why we are told to follow God? The answer is really simple, we are told to follow God because we can’t get ahead of Him! On our God chosen path for each of us we can veer to the right or to the left, we can slow down, we can stop, or we can go in the opposite direction but we cannot get ahead of God. God, right now is preparing blessings for you that will be given to you at some later date. This may seem far-fetched but one of the ways I understand God is as a Master Chef. A Chef takes the raw ingredients for a gourmet meal prepares them with loving and gifted hands then begins the cooking process. As the food cooks it aroma fills the air making the hungry recipient hunger anticipate a meal fit for king. However, the impatient diner must wait until the meal has reached perfection before he or she can enjoy the wonderful meal prepared for them. So it is with God, He looks deep in the hidden recesses of our hearts prepares our promised blessings for the day when our hunger for them is right. When I think of God has a Master Chef I am reminded of what the Psalmist wrote (which by the way is “the hope that lies before us”), “You prepare a feast for me in the presence of my enemies. You honor me by anointing my head with oil. My cup overflows with blessings.” (Psalm 23:5, NLT) The key phrase I want to emphasize is “in the presence of my enemies” at our lowest point, the point of our greatest need God fulfills His promised gives us the feast of blessings! 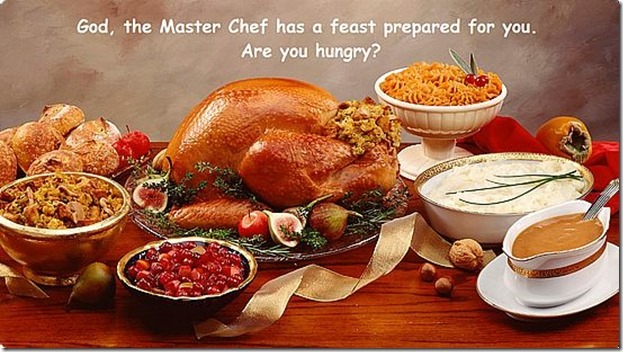 One of the best ways of keeping hope alive during periods of hunger is anticipating a personal gourmet feast prepared God, the Master Chef.